For windows that blend into the scenery and surfaces that sparkle, discover the power of our Glass & Stainless Steel Cleaner 750ml. Developed for professional and high-traffic use, this powerful cleaner features a non-abrasive formula that has been formulated to remove dirt, limescale, watermarks and grease from surfaces such as extractor fans, sinks and oven doors. These single bottles are ideal for topping up your existing stock or working within smaller businesses or those with lesser requirements than others. Keep your bathrooms and showers sparkling like new with our Bathroom Moose Citrus 650ml x 6 and our 30cm Window Blade Graphite. 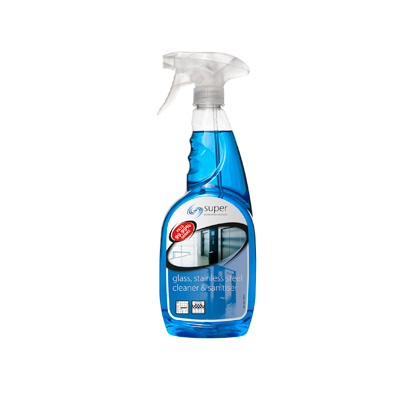 This Glass and Stainless Steel Cleaner is also available in multi-packs of 6 for high-traffic and busy working environments.